Okay, hopefully I'll get someone to look at this. Was wondering if anyone around has any knowledge of Yokohama Advan Sports. They would be installed on my Speed6. I know they are summers with short tread life, but I got about 15,000 out of the stock Potenzas with similar life so that won't be an issue. I was looking at another set of Toyo T1Rs but I found a place with the Yokos for a great price. Thanks. I have no idea, but since you are not getting much info here I would say go on tire rack, find the specific tire and check the reviews people post up there. I've seen you ask a few times, and that is one of the few Yoko tires that I have not owned. Every product that I've bought from them has been a great bang-for-the-buck tire though. pass on the T1R's unless you are getting an awesome deal on them. They are old, and have been replaced with the R1R's. As for the sports, I am not too sure on that tire. It has the same tread rating as the AD08s, but the AD08's look way more aggressive. I dunno if this helps, but I am running the Parada Spec-2's for just over a year, have more than 25k on them and well over half the tread is still intact. I never thought I'd get 25k out of them but it looks like I should be able to run them for a while still! Well I'm looking for some super good summers, I have the Eagle GTs on the stock wheels for winter time (and when I'm not home, not letting the wife chew up something she won't get any benefit from). Let me qualify, super good summers that have a decent ride. 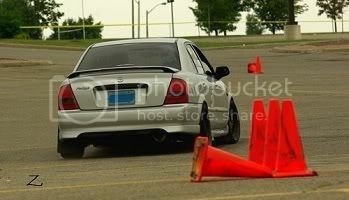 I'm not going to be autocrossing this car, just like putting a smile on my face and embarassing Camrys and the like. I really liked the T1Rs I had, I understand things move on but if I can find a deal I know they are good tires. Right now I am thinking I will go for the Yokos if they have any available when I get home. I think you'll be happy with the Yokos. As long as they aren't the Onos, I hear they screech something fierce! Local guy has em on his Speed, loves em. Had nittos on it before and got a bazillion miles on them. After talking to the wife to make sure she would put them some place, I went ahead and ordered the Yokos. If I don't like them I'll have to personally visit all of you who recommend the brand! Road trip!! !